Simon is a special boy. Never one to roughhouse with the other boys or make many friends, Simon would rather sit under the old oak tree outside his home in Sweden and tell it his innermost thoughts. The tree is his best friend in the world. His father, on the other hand and wishes Simon would do something more conventional. He wants to to run, to play, to learn how to fight. Simon would rather learn, his parents' resistance, he finally convinces them to allow him to attend a prestigious boarding school. The year is 1939, and the Nazis are on the rise in Europe, as is anti-Jewish sentiment in Sweden. Simon befriends a young Jewish boy named Isak, and the two become fast friends. But as the Nazi influence in Sweden grows, Isak's family begins to fear for their lives. Unbeknownst to Simon, his own parents are hiding a secret, that he is actually adopted and his actual heritage is Jewish. It is a secret they must not only hide from Simon but from the world, lest the Nazis learn his true origin. After the war ends, Simon and Isak remain close friends, but their lives continue down convergent paths. Upon learning the secret of his past, Simon becomes determined to discover who his real father was, and the source of his passion for art and music. It's a very "literary" film, and that's not surprising given that it was based on the novel by Marianne Fredriksson. Director Lisa Ohlin surprisingly does not delve into the inherent drama of a young Jewish boy posing as gentile during the Nazi occupation of Sweden as deeply one would expect. In fact that's only a small part of the big picture. 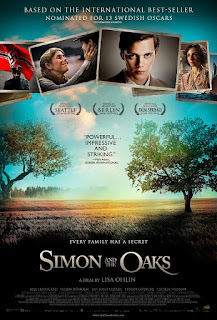 Ultimately, Simon and the Oaks is a film about discovering ones roots and discovering life's unexpected and beautiful connections. And in some ways that's a bit refreshing. Ohlin doesn't push the film into directions that feel false or contrived. It feels like an unfolding novel, but never feels unfocused or incohesive. It's just simply a good story. There's a certain charm about its relaxed and unhurried pace. Ohlin allows the story to unfold gradually and organically. It's a gorgeously mounted production, and I'm honestly surprised this was not Sweden's official foreign language entry to the Academy Awards. This is absolutely the kind of thing the Academy goes for. While that may sound like a backhanded compliment given Oscar's recent track record, Simon and the Oaks is actually a thoroughly engaging film. It's no groundbreaking masterpiece by any means, but its well made and likable, a handsomely produced coming of age tale told with plenty of heart and visual pizzazz. There is certainly a place for such traditionally structured prestige epics, and this one stands apart from the pack with its completely unironic sense of earnestness. It hits all the right notes amid potentially cliched elements, adding up to a film of beguiling skill with a surprising emotional punch. SIMON AND THE OAKS | Directed by Lisa Ohlin | Stars Bill Skargård, Jonatan S. Wächter, Helen Sjöholm, Stefan Gödicke, Jan Josef Liefers, Karl Linnertorp, Karl Martin Eriksson | Not rated | In Swedish w/English subtitles | Now playing in NYC. Opens today, 10/19, in LA.